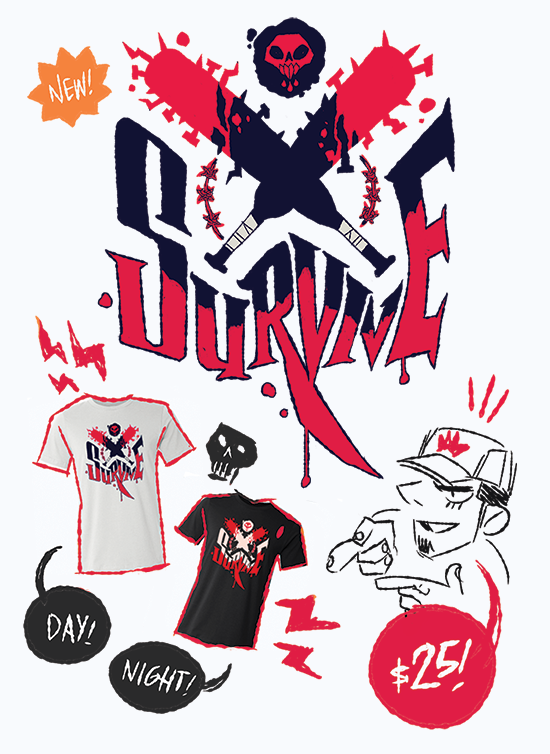 Added a new shirt to my store! It's the tee that Logan is wearing in the latest chapter! You can now match this lost, sweet boy. So life has been a little bit crazy lately. GOOD! But crazy! I'm currently in the middle of a very sudden move, got a second job at Starbucks to peddle beans, and just came back from ECCC in which I caught a tiny bug! Things are on the up and up, but for the rest of this week and the next week, I'm going to be posting some of my experiences while I've been transitioning on T and also just other things going on. You can also see all of them right now at my Patreon! I'll also be posting some story stuff about the comic I plan on doing after Not Drunk Enough later this month there if you're interested! I'm so EXCITED to be going back to ECCC! It's such a wonderful con, and I always have a blast. 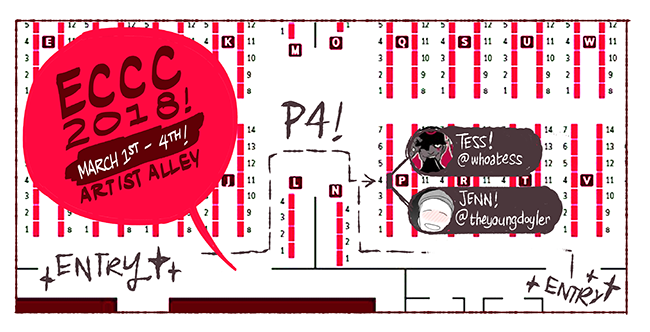 I will be tabling with Jenn Doyle of Knight's Errant at table P4, so please come by and check out the rad stuff we'll have and also just to say hi! As usual, I'm surrounded by even more amazing talent, such as Ananth Hirsh and Yuko Ota of Johnny Wander, Brian Clevinger and Scott Wegener of Atomic Robo, Ru Xu of Saint for Rent, Ngozi Ukazu of Check Please! and George Rohac of Organized Havoc who wrangles us every convention, which must be a little like herding cats. Also, I'm sad to say that between a very sudden move, ECCC and catching up on deadlines, I won't be able to update Not Drunk Enough with comic pages until I return! Thanks so much for understanding!! SEEN NOTHING YET 1 & 2 HARD COPIES AVAILABLE! Have you ever wanted to read an erotica book about two amateur ghost hunters who were kinda bad at their job but really good at making out (and beyond)? WELL THEN. Let me tell you, I have SOMETHING UP MY SLEEVE. 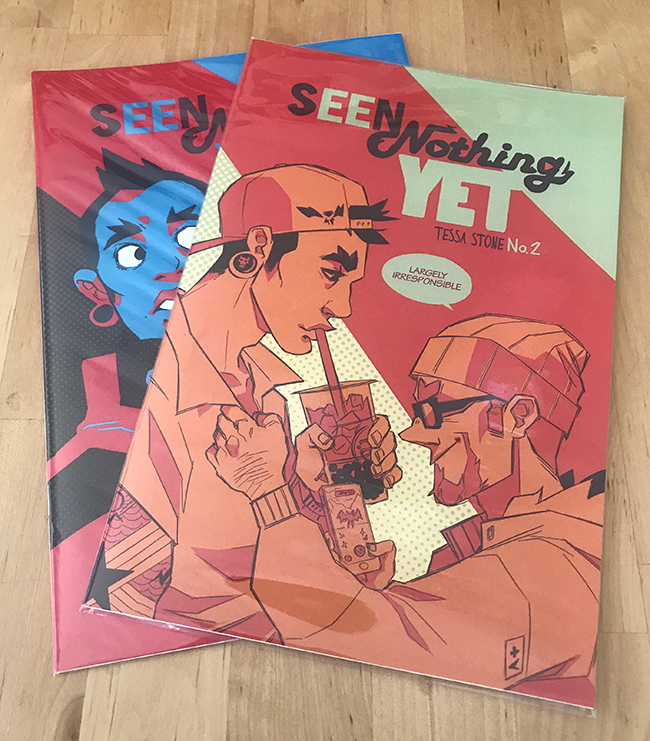 Seen Nothing Yet is an on-running erotica series about Owen and Nash that is also hosted on Slipshine (18+ only to click!!) and is now available to purchase at my on-line store! Only previously available at conventions, you can now have your own 24-page full color copy of some of this delightful nonsense. CLICK HERE FOR THE LINK FOR BOOK ONE! CLICK HERE FOR THE LINK FOR BOOK TWO! If you're interested in seeing the THIRD installment, please check out Slipshine (18+++++ STILL!!) !! Love you all! Hi everyone! 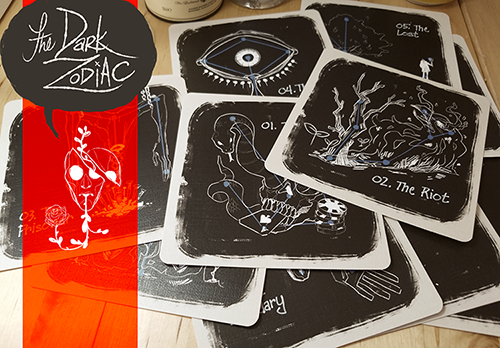 I'm happy to announce that I've launched the Dark Zodiac on Kickstarter! Click HERE to see! UPDATE ON MY SWEET CAN SON, LOCK! As I've mentioned before, Lock got diagnosed with small cell lymphoma. I have to thank you all from the bottom of my heart the flood of support and well wishes that both he and I received. It was truly moving and meant so much! He's been on chemo for several weeks now, and has been already improving drastically! He's gained some weight, as well as picked up in mood and energy level. Recently, he went in for a follow-up and they were happy to report back that his intestines have started to return to their more normal size, and be less thickened. There's a large chance that in a year or so, he will enter remission, and no longer need medication! Thanks again for all your support, and I'll continue to keep you in the loop of my sweet fur child. Until then, thank you so much for your patience and love and everything! I hope you are all having a wonderful holiday!! My cute cat son being sick...! I hate doing this kind of stuff, but I've been not only struggling with balancing the payments for my hormonal therapy to transition, but now I want to be able to give my cat Lock the best treatment that he needs in order to recover. He recently started losing quite a bit of weight, and taking him into the doctor revealed that an unusually large mass was found in his abdomen. We immediately went to do tests and it turns out that there's a very high chance that he has small cell lymphoma, which is something our other cat (Puck) was diagnosed with a year ago. It's very unusual for two cats in the same household to have this problem, and it's absolutely NOT contagious or something they can get from their environment, so it's very surprising and a little disheartening. However, it's also hopeful, because Puck bounced back very well from treatment and is still recovering wonderfully. It just also means that one more cat requires a heavy stack of vet bills that are getting tough. Posted are a few pictures of what I've had to cover because of his sickness (minus the flea medication, that's just a refill). That said, anything helps! I'll be posting on my Patreon about his journey, my journey on T, and his recovery, and I thank you SO much for taking the time to listen! Love you all, and thanks for your support as always! 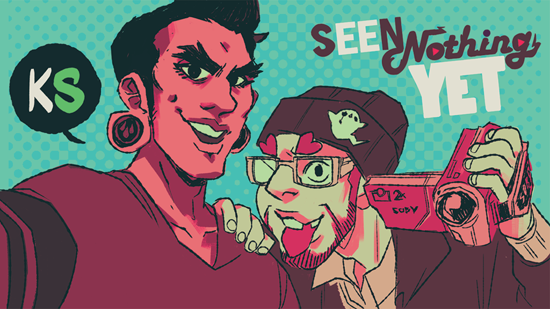 Here's an example of the wallpaper that Patrons got last month! Just added the eyeplant enamel pint to the store, so if you've been itching to pick that up here's a good chance!! Thanks again for all your support and understanding! YOU GUYS ARE THE BEST!!! Hey guys! So it's been a ilttle over a week since I've been on T, and I've decided to share some of my feelings and thoughts on this. Right now I'm juggling mutliple deadlines, as well as playing catch up to a lot of things, so I apologize that Not Drunk Enough pages are suffering right now as a result! However, the good news is there's a lot of cool things I'm working on that will come out and play soon that I hope you guys all dig! A little extra on the comic above, this is partially the reason why things have been so slow on my end. On top of my wrist and just life being WHOA sometimes, I've had to spend a lot of time figuring and sorting myself out. I appreciate WHOLEHEARTEDLY your patience, and your support. I came out on twitter a week ago and the feedback and support from you guys was overwhelming. I can't thank you enough, or express properly how emotional it made me. Moving forward, I feel excited. Free. Happier than ever. I hope this can start trickling into the work I do and my output. Thanks again for sticking with me through thick and thin, and I hope you're having a wonderful week!